Why you should use this calculator? 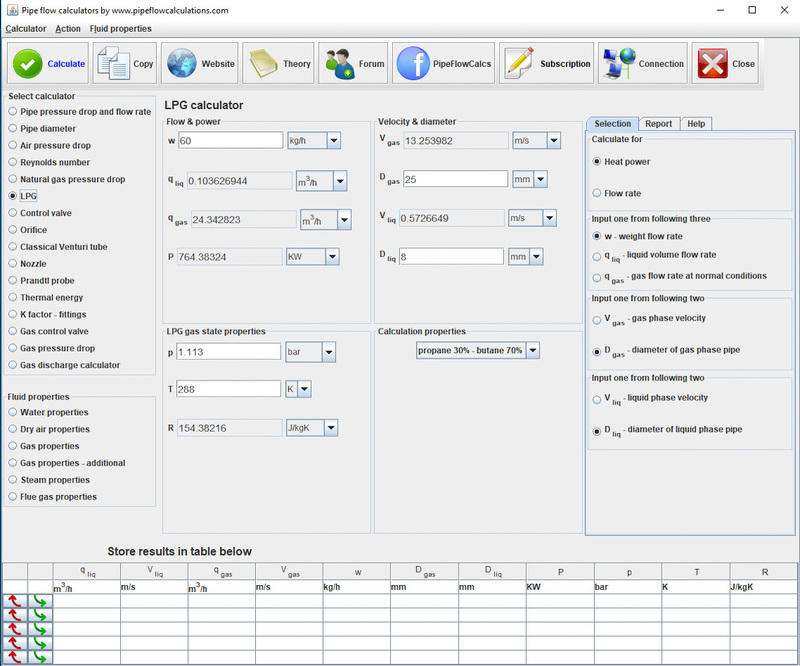 The calculator can be used for estimation of flow rate, pipe diameter and heat power of liquefied petroleum gas - LPG. Liquefied petroleum gas is a mixture of propane, butane, and other components. As an example, you can use the calculator to determine the necessary flow rate of an LPG in a gas furnace, for required burner heat power. The calculator is applicable for calculation of flow rate and heat power of gas and liquid phase of LPG. It can be used for calculation of clear propane or clear butane gas flow as well. Propane and butane in a gas state are compressible. The calculator considers LPG as incompressible which is correct only for LPG liquid state. All physical properties, like mixture density or LPG component partial pressure, are calculated for the selected propane-butane mixture ratio. The calculator can be used for computation of pipe diameter when the flow rate is known. The flow rate of LPG can be presented as mass flow rate, volume flow rate of the liquid phase or as a volume flow rate of the gas phase at standard conditions. You can't use this calculator to calculate pressure drop through the pipe line. For that purpose please select pressure drop calculator for liquids or for gases.